The Long Abandoned Residential AreaLamanai has an extraordinarily long history, with the earliest signs of settlement coming from pollen, which indicates there was maize cultivation back as far as 1500BC. However, very little is known about the site’s history despite its long occupation. This is partly because so little has been excavated (approximately 5%) and partly because they left very few monuments that provide written accounts. Therefore, Lamanai’s history lies within and around its buildings, where the scattered remains of offerings and religious activity can be found. Using traditional archaeological techniques, historians have been able to piece together pottery and other datable artefacts, such as obsidian blades, stone tools and jade jewellery, to provide a time-line for the city’s occupation and the development of its ceremonial centre. W0759: Preclassic Pots The earliest evidence of an organised society is found in the superb collection of ceramic bowls that are now housed in the on-site museum. These bowls date from the mid and late Preclassic Eras, between 900BC and 200AD1. Of particular note is the “Crocodile” pot (fig. W0759) that was found in Burial 6, underneath Structure P8-9. This Preclassic pot is very early evidence that the city was named “Lama’an’ain” (Lamanai being a corrupted Spanish version, which actually translates to Drowned Insect). The crocodile pot indicates that the people of Lamanai were beginning to convey their religious values and political power through art and pottery ware. The fact that the pot was found in one piece within a burial beneath a building reveals a lot about the religious principles and social order at Lamanai at this very early date. These pots wouldn’t have only been made for the elite of the city or to be offered to the god’s (as this pot was), but they would also have been traded, thereby spreading Lamanai’s political stature and religious beliefs to the surrounding area and potentially much farther afield. W0744: Mask from Mask TempleThe Mask Temple, which is also known as Structure N9-56 (fig. W0744) is next on the historical time-line. Excavations have revealed that earlier constructions of this temple date back to the Formative Classic period between 400BC and 200AD. The Mask Temple is named so because of the two masks which flank the stairway. These masks appear to demonstrate a link to the Olmec civilisation with rubbery lips, a slightly upturned top lip and a wide nose. 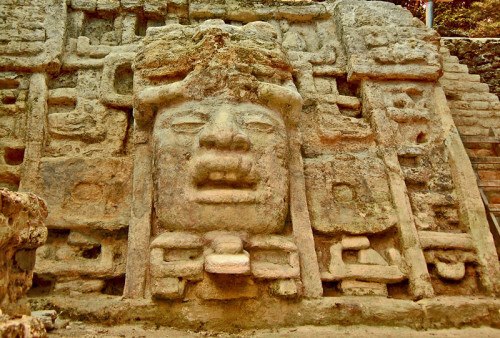 The Olmec flourished between 1500BC and 400BC, which is much the same time-frame as Lamanai’s suspected prehistory. 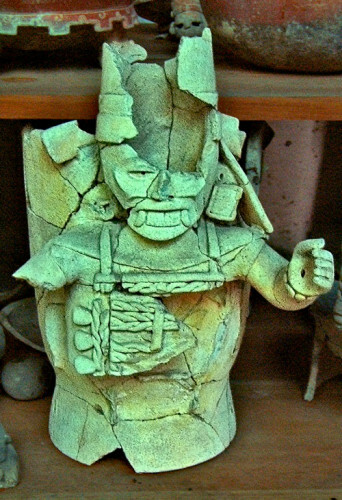 The Olmec were prolific traders and had a network that is known to have reached as far as Guatemala because this is where the “Olmec blue” jade was mined. 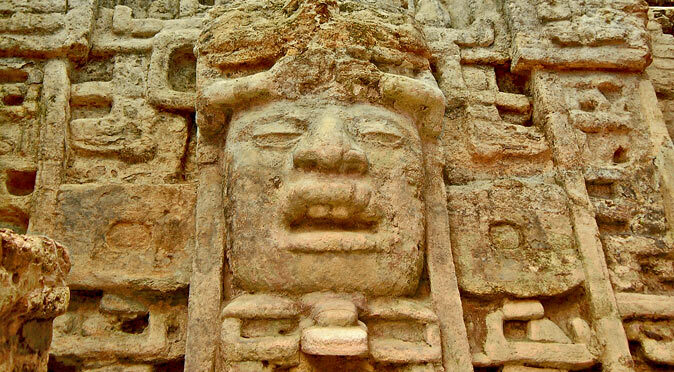 With signs of trade and Olmec artistic influence, it is likely that Lamanai was in contact with the Olmec directly and that the Mask Temple was erected at some point prior to 400BC. W0746: High Temple N10-43The High Temple (fig. W0744) is also surprisingly old, especially considering its towering height. The High Temple, also known as Structure N10-43, was built over an older residential area, where the refuse of domestic living starts from 300BC and terminates at 100BC. This implies that the temple was built over the residential area in 100BC. To support this date, pottery offerings that are thought to have been left when the building was consecrated, have also been dated to 100BC. 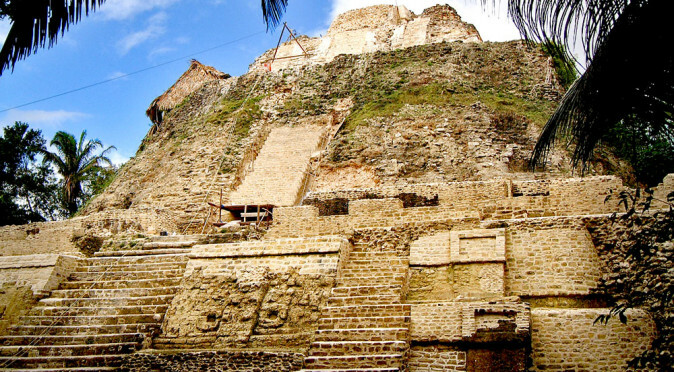 Measuring over 30 metres tall, the High Temple would have been the tallest building in Mesoamerica at this time. In most Mesoamerican cities, the religious buildings were organised around a plaza with an east-west, north-south alignment. At Lamanai, this was completely disregarded as they worked south along the bank of the river, with no cardinal alignments of the temples and no main plaza. This flow continued well into the Classic Period, when they extended even further south and erected the Jaguar Temple in the 5th century. 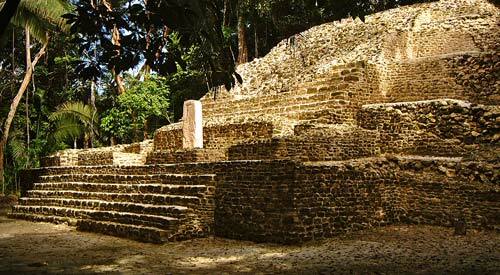 Further disregard for traditional Mayan practise is evident in Lamanai’s structural designs. Building projects completed in the 4th and 5th centuries not only added the Jaguar Temple, but also rejuvenated the High Temple and Mask Temple, with increasing emphasis on their unique style, known as the Lamanai Building Technique (LBT). 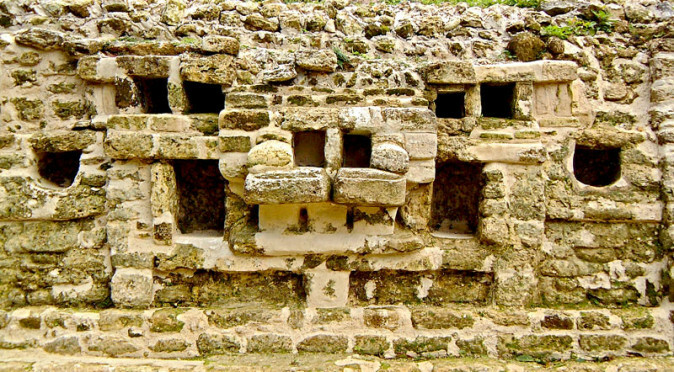 Rather than mounting their temples at the top of the pyramidal bases, as was customary elsewhere, the Lamanai style used projecting layers from the pyramidal base to provide terraces for the temples to sit on. The Maya believed their temples were sacred caves and that the elevated structures on which the temples rested were sacred mountains. By mounting the temple further down the structure, the people of Lamanai were replicating what they saw in nature rather than what the saw at other cities. W0748: Stela Temple – N10-27 The next phase of Lamanai’s history is quite clear, as there is a monument that records it. Stela 9 was erected on the 10th March 625AD to commemorate an important religious event, which is most likely to have been a significant celestial alignment (click here to read more on this subject). Stela 9 tells us that the ruler’s name was Smoking Shell and pictures him wearing the typical symbolic attire of a Classic Period Mayan lord. And yet Stela 9 was unusually set inside a temple chamber on the first terrace of a fairly low pyramidal temple structure (fig. W0748). So whilst Stela 9 tells us that the people at Lamanai were using the common Mayan religious political structure, with an omnipotent god-king ruling the city, the stela and its setting tells us that the people of Lamanai are using a very different religious order. By erecting Stela 9 on a non-katun period event and placing it within a temple situated on a large terrace at the bottom of a pyramidal base, the people of Lamanai demonstrated a number of distinctly independent religious ideas. 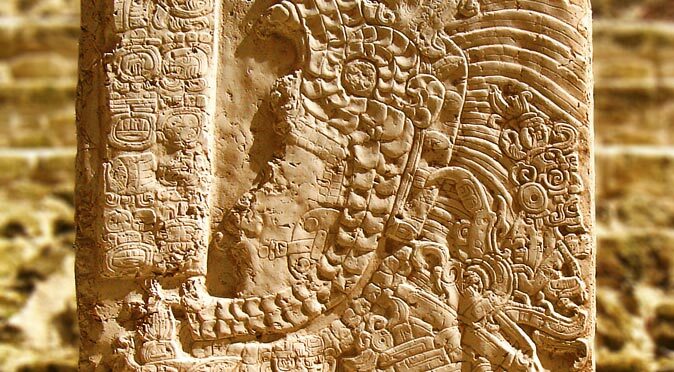 Despite their separation from Classic Maya ideology, Lamanai was far from isolated and is likely to have played a central role in the Mayan trading network. Pottery, jade and other artefacts that were clearly brought into the city from far away have been found in abundance. These weren’t just foreign fancy goods that were traded with strangers, they were important religious artefacts that were used in religious ceremonies and thought to hold sacred power. A 5th century burial found within Temple N9-56 was found with Jade jewellery that must have come from the region close to Copan, and Stela 9 depicts the 7th century king, Smoking Mirror, also wearing traditional jade jewellery. W0758: Mayapan-Style CenserA late addition to the Mask Temple was a platform designed to house an ancient stela. During the ritual reconsecration of the temple, censers were used to burn incense and then were smashed around the temple. 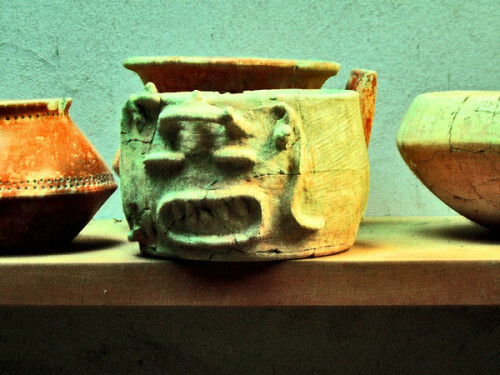 The censers were of a distinctive Mayapan-style (fig. W0758), which can be dated to the Post Classic Era (13th to 15th centuries). This find demonstrates that Lamanai’s Classic Period religious buildings were still being used for rituals when the majority of Classic Period cities had quite literally fallen-apart, following the Classic Maya Collapse of the 9th and 10th centuries. The collapse appears to have been triggered by a prolonged drought, which was blamed on the god’s and led to the people revolting against the major city’s divine rulers and their sacred ancestral temples. 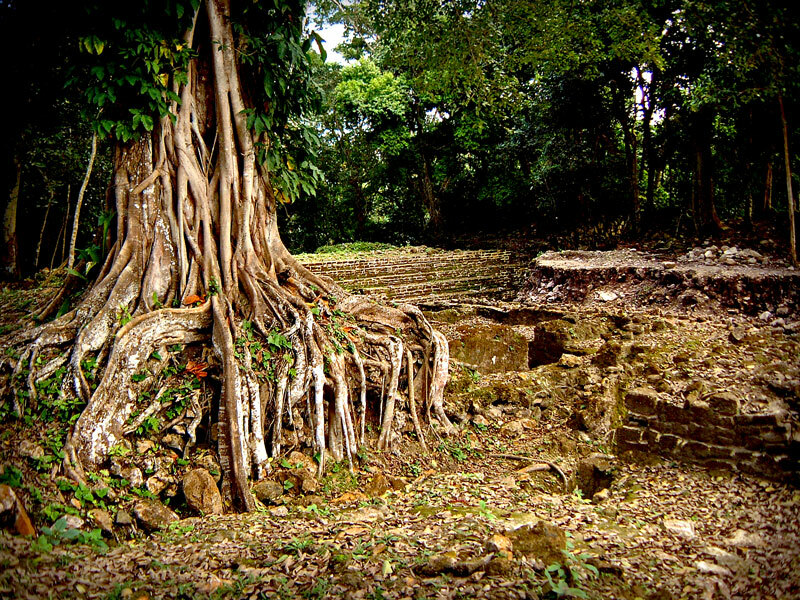 It is quite possible that Lamanai’s independent view of religion helped the city survive this collapse. The Spanish subjugated Lamanai in 1544 and converted the population to Christianity. They built two Churches over existing Mayan temples, as was customary, and then left a regional Christian priest to assist them in their newly reformed lives. 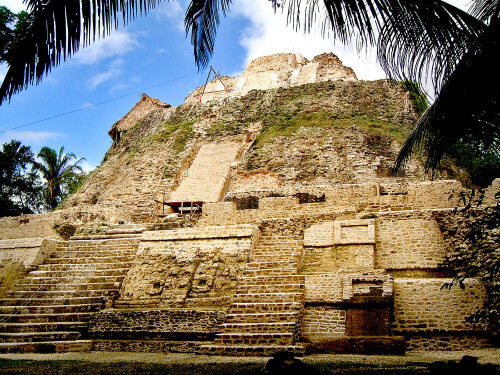 100 years later, in around 1641, the Maya renounced their new faith, burned the churches and destroyed the new settlement that surrounded it. 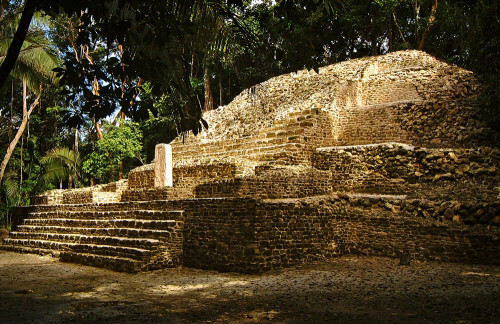 The Maya reconsecrated the church as a Mayan temple and continued living in the village area around Lamanai into the 18th century.